This is one of my 18 month old daughters favorite toys, she got it for her first birthday and has loved it since. She can bang on the xeliphone, use the hand clappers and even play the kazoo by herself. The sounds these toys make are not irritating at all (unlike some musical toys) overall I'm very happy with this toy and definitely recommend it. Very nice review, Kinda wish my preschooler was younger again. 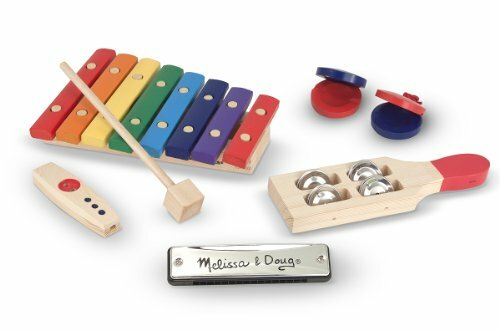 But thank you for sharing this and it is very nice and colorful and I know my oldest would of loved it too(especially that it comes with a harmonica so she wouldn't have to share hers with her sister lol)..